Beginning July 1, the fee for a Colorado driver license will increase by $1--from $26 to $27. Other fees are unchanged. This increase was a result of House Bill 16-1415, intended to offset the cost of providing Division of Motor Vehicles driver services. The fee for a driver license under SB-251 - the Colorado Road and Community Safety Act - will not change, since the cost of providing the service is already fully recouped. 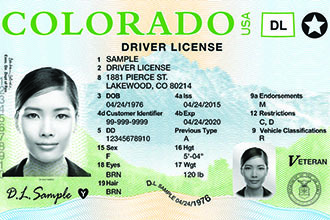 Additional information about fees is available at www.colorado.gov/dmv/driver-license-and-related-fees. A description of services provided by the Colorado Division of Motor Vehicles may be found at www.colorado.gov/dmv. The DMV encourages people to skip the trip to the DMV by using one of the 18 online services, including driver license renewal, available at mydmv.colorado.gov.